In the lead-up to this week’s launch of Hearthstone’s new Journey to Un’Goro expansion, Blizzard Entertainment ran a limited-time promotion that rewarded players with unique prizes for each day they logged in. April 5’s prize was a free Un’Goro card called the Volcanosaur. Giving the card away for free was certainly a generous move on Blizzard’s part, but one caveat about the gift made April 5, 2017 one of the weirdest moments in Hearthstone’s history. Since the card was made available for immediate use in competitive play, it created a bizarro-world version of Hearthstone that would only last for a single 24-hour period. This is because April 6 is not only the release of Un’Goro,but also the day that three Hearthstone expansions—Blackrock Mountain, The Grand Tournament, and League of Explorers—rotate out of the game’s Standard mode. Coordinating via Reddit, players dubbed April 5 “Day of the Volcanosaur” and built entire decks around the card to celebrate its fleeting synergies across expansions that would no longer exist once the clock struck midnight. By pairing the Battlecry-doubling Brann Bronzebeard with the Volcanosaur, for instance, players get a 7-drop that comes with four buffs, each hand-picked to fit the current scenario. Pair those two with a Menagerie Warden, which summons a copy of a friendly beast, and you get three hulking Volcanosaurs with four buffs each. Pretty good stuff. Watching the Hearthstone metagame evolve in double time this way was a beautiful thing, as players scrounged for new interactions and coordinated their efforts toward carving out a perfect niche for this lonely premature dinosaur. 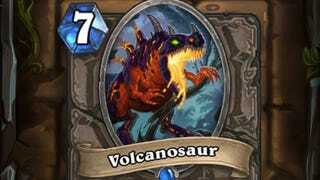 Sadly, for the Volcanosaur, the pre-apocalyptic feel of it all felt almost too apt: Even though the card ruled the ladder on April 5th, it’ll most likely fall into status as a totally mediocre 7-drop once the Un’Goro meta does finally start to calcify and, like its gigantic reptilian ancestors millions of years ago, will most likely disappear from the face of the earth. So here’s to you, Volcanosaur: even though you faced almost certain extinction, you dared to imagine a pre-Un’Goro Casual play experience free of scummy tryhard Pirate Warriors and Aggro Shamans. And we are all better off for it.